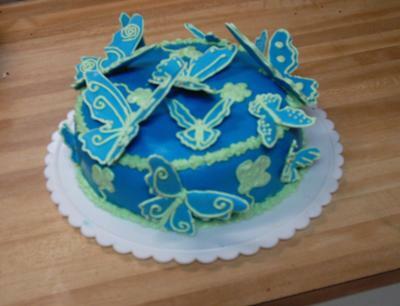 This butterfly birthday cake was pretty easy to make although it took a little time. I made it for my 18th birthday and I was pretty glad with the outcome because it was my first fondant experience as well as my first full sized cake. The first thing that I did was make the butterflies. I had a template in a book for the outline of the individual wings that I made copies of. I covered the paper with greased plastic wrap. I went around the outline with royal icing, waited for the piping to dry and then flooded the inside and set them aside to dry overnight. I made sure to start two days in advance to allow for dry time. The next day I piped designs on the wings, then removed them from the plastic and placed the corresponding wings together on cardboard that I had folded into Vs (like folding paper fans)and covered in wax paper. Then I piped a body down the center of the wings and let them dry overnight. The actual cake is an 8-in devil's food cake with a light cream cheese frosting in between the layers and under the fondant. Once the cake was done and frosted, I covered it in fondant that I had dyed blue. I then outlined the edges with left over royal icing from the butterflies and attached the butterflies with royal icing. It seemed to need something extra so I added some last minute flowers with the royal icing as well. how did you make your butterflies?